Spanish riot police used cranes today to clear a major thoroughfare in Madrid that was blocked by striking taxi drivers. The drivers have been on strike since last week to demand tighter regulations for app-based ride-hailing services like Uber. Dozens of riot police wearing crash helmets and carrying shields descended on the central Paseo de la Castellana and with the aid of the cranes removed taxis which were blocking the key boulevard which runs north-south through the Spanish capital. Despite the tension between the taxi drivers and police, there was no violence. After the first vehicles were removed, drivers at the head of the column of taxis slowly started to drive away while honking their horns, according to reporters at the scene. Like their counterparts in many other European countries, Spain’s taxi drivers say that ride-hailing apps like Uber, or its main Spanish rival Cabify, have made it impossible to compete. Madrid taxi drivers began an open-ended strike on 21 January and had threatened to block traffic in the Spanish capital on Monday with the help of others who have joined them from cities across Spain. ‘The legitimate right to strike does not include the right to paralyse the city,’ the central government’s representative in the Madrid region, Jose Manuel Rodriguez Uribes, wrote on Twitter. 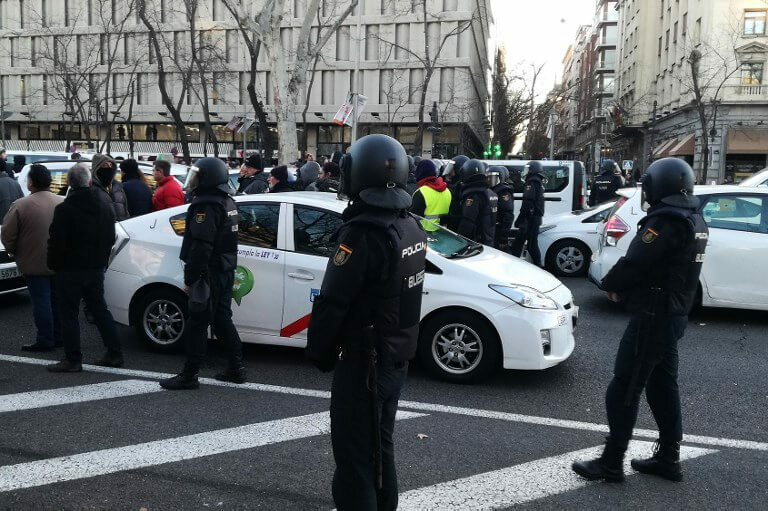 Taxi drivers later protested outside of the headquarters of the conservative People’s Party (PP), which governs the Madrid region and is responsible for rules regarding taxi and ride-hailing services, before heading to the airport. They then gathered outside the headquarters of Madrid’s regional government in the central Sol square. The strike will last ‘as long as it needs’, taxi driver Angel Vallejo said outside the PP headquarters. ‘We have nothing to lose, We are already lost. Things can’t get worse, so we are going to fight until we are exhausted,’ he added. Barcelona taxi drivers called off a six-day strike on Thursday after the regional government of Catalonia unveiled new regulations which makes it possible for cities in the region to require customers of ride-hailing services to book a ride at least an hour in advance. But the head of the regional government of Madrid, Angel Garrido, has refused to adopt the same measure, saying that Catalonia is ‘heading to the Middle Ages’ with such a solution. Uber and Cabify have said that the regulations planned by Catalonia will put them out of business on the northeastern region.